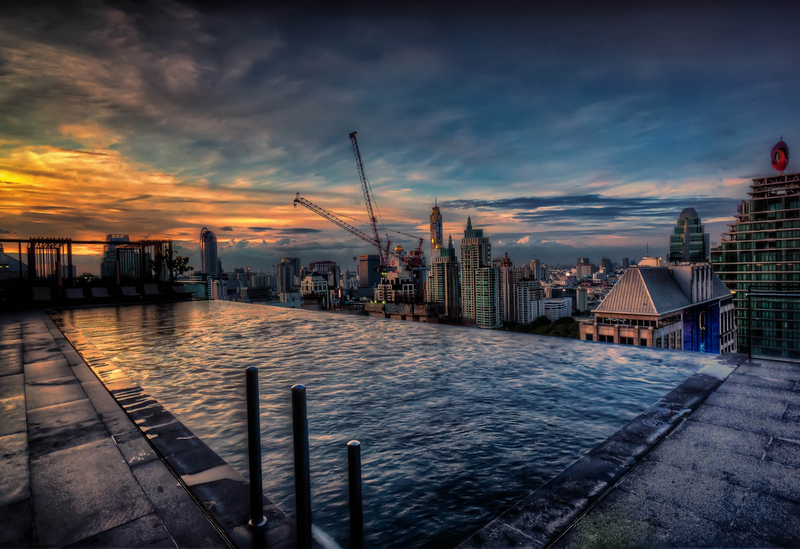 Most serviced apartments in Bangkok are located along the BTS and MRT lines. You’ll find the majority of serviced apartments along Sukhumvit Road — particularly between Nana and Phrom Phong BTS stations — although you’ll also find a good mix of apartments in other areas. Below, we’ve listed 15 of Bangkok’s top-rated serviced apartments. All of the apartments below are grouped by price, ranging from sub-35,000 baht per month budget apartments to luxurious options located inside five-star hotels and private buildings. Since all of these serviced apartments are available through Booking.com, all you need to do to book is click through and enter your dates. We’ve included location information for each apartment, with data on the nearest BTS and MRT stations, as well as information on the facilities you’ll find inside the building. Note that the total rent can vary from month to month in Bangkok and may exceed the listed price in high season. Bangkok has a good selection of budget serviced apartments available for 30,000 baht or less per month. While you won’t find luxurious suites in this price range, you will find a good variety of buildings with spacious, comfortable rooms and acceptable facilities. Located in a small sub soi off Ekkamai Soi 10, Greenview Ekkamai 10 is an inexpensive serviced apartment building with a selection of small units available. Rooms start from 32 square metres and include a kitchenette, balcony and a large bathroom with bathtub. Pricing at Greenview Ekkamai 10 starts from just over 30,000 baht per month, making it one of the most affordable serviced apartments along the Sukhumvit Line of the BTS. The building is a quiet 10 to 15 minute walk from the BTS, or less than five minutes by taxi or motorcycle taxi. Greenview Ekkamai 10 includes all of the usual services, such as fast Wi-Fi and daily cleaning. It also has good facilities for a budget serviced apartment, with an outdoor pool and a small fitness room for guests. All in all, this building is a good option if you have a limited housing budget. Located on Sukhumvit Soi 8, Eight Ville is a short five to 10 minute walk away from Nana BTS and just a few stops from Siam, Asok and other major interchange stations. With units starting from just 33,000 baht per month, this is a good low-cost apartment in the heart of Bangkok. Most of the rooms available are fairly small (starting from just 25 square metres) and include simple furniture such as a bed, desk and closet. Each room has a small kitchen when a sink, microwave and basic dining and cooking items. One downside of this serviced apartment building is its lack of a pool or gym. It’s also located in a busy nightlife area, which makes it less than ideal for families. However, thanks to its location close to the BTS, this is a great option for solo travellers looking for a cheap, simple apartment. Located in one of Bangkok’s busiest residential areas, The Room Ratchaprarop is a low-cost, modern serviced apartment building with a variety of clean and comfortable units available for rent. Apartments here are priced fairly and offer comfortable bedding and plenty of sunlight. While small (they start from 25 square metres), the units here are kept very clean and include work desks, modern bathrooms soft, comfortable bedding. Since this apartment is located just off Ratchaprarop Road in a local, non-touristy area, you’ll have easy access to Thai street food and local restaurants. The building is a 10 minute walk from Victory Monument BTS, from which you can reach Siam Station in under 15 minutes. If you want to stay in a middle class Thai neighbourhood away from the busy hustle and bustle of Sukhumvit, The Room Ratchaprarop is one of the best budget serviced apartment options you’ll find. Another option in a middle class Thai neighbourhood, My Condo On-Nut by RJ is a serviced apartment building located a short five minute walk away from On Nut BTS. Units here are mid-sized and comfortable, starting from 35 square meters. They’re also extremely affordable, with prices starting from just under 30,000 baht per month for a furnished one-bedroom unit with Wi-Fi. Since units are located inside the My Condo 81 condominium, you’ll have full access to the pool and fitness room as a guest. Daily maid service is provided by the staff, with an on-site laundry room for cleaning clothing. If you’d prefer to stay inside a regular condo building than a hotel, My Condo On-Nut is a good affordable option. Priced fairly and located just five minutes from the BTS, you’ll be able to save money while enjoying one of Bangkok’s most popular centrally located neighbourhoods. If you’re on a limited budget and want a cheap, simple and comfortable room for the month, you won’t find many better deals than Diamond Residence Ratchada. 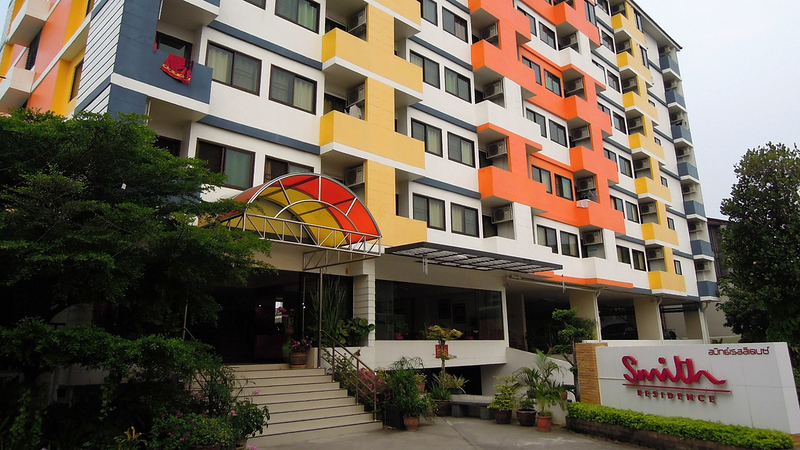 This low-cost hotel/apartment building is located a short five minute walk from Huay Kwang station on the Bangkok MRT. Rooms in Diamond Residence are cosy and comfortable, with a large double bed, leather sofa and work desk. Many rooms have floor to ceiling windows and receive a fair amount of daytime sunlight, making them feel bright and roomy. Diamond Residence includes all of the usual services, such as daily room cleaning and Wi-Fi in all rooms. While it has an on-site restaurant and fitness room, it unfortunately doesn’t include a swimming pool. Still, with prices starting from around 20,000 baht per month, it’s hard to beat this when it comes to value for money. If you need a comfortable but inexpensive room and don’t mind spending 10 to 15 minutes on the metro to get to Sukhumvit, Diamond Residence is a great value option. Serviced apartments in the 35,000 to 70,000 baht per month range tend to offer better locations and easier access to public transport. We’ve listed five mid-priced options below, most of which are located along the Sukhumvit BTS line. Located just two minutes from Punnawithi BTS station, Olive Residence is a modern, mid-priced serviced apartment with a selection of comfortable studios and one-bedroom units. All units are equipped with free Wi-Fi, although only the one-bedroom and larger units have kitchens. The biggest advantage of this building is the fact that it’s only a couple of years old, and as such has a great selection of ultra-modern apartments. It also has an on-site restaurant with delivery to all rooms and a large, sunny lobby. Olive Residence does not have a swimming pool, which is a slight annoyance. It’s also quite a long way from the centre of Bangkok, although the extremely convenient BTS station a short walk from the building makes up for this. If you have a low to medium budget and want an affordable serviced apartment that’s available for just over $1,000 per month, Olive Residence is a good choice. Just be aware that it’s a 15 to 20 minute ride on the BTS to reach most of Bangkok’s popular shopping and nightlife areas. Ten Ekamai Suites by Aspira is a modern serviced apartment building located on Ekkamai Soi 10. Close to some of Bangkok’s most popular cafés, restaurants and nightspots, this serviced apartment building is one of the best mid-priced options along the Sukhumvit BTS Line. Rooms in Ten Ekkamai Suites are clean and modern, with kitchen facilities and a small dining area. Starting from 35 square metres, they’re big enough to feel comfortable and pack a living area and separate bedroom into the space available. The building itself is modern and includes services like free Wi-Fi, daily room cleaning and a free shuttle to BTS Ekkamai. There’s also a fitness centre and outdoor pool that provides an excellent view over the surrounding area. Priced from just over 30,000 baht per month, the rooms here are a great deal if you’re looking for a conveniently located, comfortable serviced apartment in one of Bangkok’s most desirable residential areas. Ariva Ivy Servizio Thonglor is a luxurious serviced apartment building located on Sukhumvit Soi 55 — one of Bangkok’s most fashionable streets. Rooms here are modern and luxurious, offering great views over Bangkok, modern leather furniture and very upmarket decorating. They’re also equipped with free Wi-Fi and come with small kitchens, allowing you to cook your food at home, if you so desire. In addition to the standard studio rooms, which are available for just over 60,000 baht per month, a variety of one-bedroom suites are available. The biggest advantages of Ariva Ivy Servizio Thonglor are its location — it’s just a few minutes from some of Bangkok’s hottest bars and clubs — and its facilities. This building has a luxurious outdoor rooftop pool that provides a great view of the area, as well as a large fitness centre. Add its opulent lobby, children’s playroom, outdoor garden and convenient location close to J Avenue shopping centre into the mix and Ariva Ivy Servizio Thonglor is a great option if you’re looking for a luxury serviced apartment with a mid-range price. Located near the Chao Phraya River on Charoen Krung Rd, The Sunreno Serviced Apartment is a good mid-priced serviced apartment for people that want to be located closer to the Silom business and shopping area than Sukhumvit. Rooms here are spacious and well equipped, with kitchenettes and great views over the river and nearby Asiatique shopping and dining area. The building itself is a 10-15 minute walk from the BTS but offers a free shuttle service for guests. Services include daily room cleaning and free Wi-Fi. The building itself does not have a gym or swimming pool. If you’re looking for a mid-priced serviced apartment near Sathorn and Silom, The Sunreno Serviced Apartment is one of the better choices in the area. With units starting from 75 square metres, 38 Mansion has some of the largest rooms of any serviced apartment in Bangkok. It’s also conveniently located 10 to 15 minutes from Thong Lo BTS on foot and less than five minutes away by motorcycle taxi. The building management operates a free tuk-tuk shuttle service to and from the BTS, which you can contact by phone throughout the day. Rooms here are extremely spacious, with the smallest one-bedroom apartment offering a full 75 square metres of space. They’re also well furnished, with leather sofas, flatscreen TVs and large beds with soft, clean bedding. 38 Mansion has an outdoor swimming pool with good views of the local area and a small fitness room. The only real downside of this building is that it’s starting to show its age, and many of the rooms have slightly outdated kitchen and dining room furniture. If you can tolerate the occasional 90s kitchen cabinet and slightly outdated carpets, 38 Mansion offers some of the largest serviced apartments in Bangkok at very fair prices for the area. If your budget allows, Bangkok has a great selection of ultra-luxury serviced apartments offering premium locations and incredible facilities. The five apartments below are all located in the city’s top shopping and entertainment districts and offer a variety of world class rooms and suites. 39 Boulevard Executive Residence is an upmarket serviced apartment located a 10-15 minute walk (or five minute motorcycle taxi ride) from Emquartier and Emporium — two of Bangkok’s biggest shopping malls. Units in 39 Boulevard are very spacious and comfortable, starting from an impressive 70 square metres for the smallest one-bedroom apartment. All units have full kitchens with pots, pans and other cookware, allowing you to prepare meals from home. The building itself is a short walk from the nearest supermarket and close to a huge selection of Thai and international restaurants. Rooms are cleaned daily and come with free Wi-Fi and full access to the building’s facilities. With a large outdoor pool, fitness room and sauna, the facilities at 39 Boulevard are some of the best of any serviced apartment in Bangkok. Priced above most serviced apartments but below a five-star hotel, this is arguably one of the best serviced apartments in the Phrom Phong area. Located on Soi Ruamrudee, Aetas Residence is a luxurious five-star serviced apartment that’s a short 10 minute walk from Phloen Chit BTS station. Units are large and extremely luxurious, with the smallest studios starting from 45 square metres. All apartments include fully equipped kitchens with a microwave, electric stove and fridge. One very nice point of this serviced apartment complex is that units also have washing machines and dryers, saving you from having to take your clothing to a separate laundry room. In addition to studios, Aetas Residence has a variety of one and two-bedroom suites, many of which have great views over Bangkok. All units are cleaned daily and come equipped with free high-speed Wi-Fi. Finally, Aetas Residence includes all of the facilities you’d expect from a five-star hotel, including an outdoor pool and well equipped fitness centre. It’s also a short five to 10 minute BTS trip from Siam and Asok — two of Bangkok’s biggest public transport interchanges. Located directly on top of The Emporium, one of Bangkok’s most popular upmarket shopping malls, Emporium Suites by Chatrium offers five-star serviced apartments with sweeping views over Bangkok. Rooms here are large and beautifully furnished, with the smallest Superior Double rooms an impressive 55 square metres. All rooms include kitchenettes, bathtubs and other features not commonly found even in Bangkok’s five-star hotels. As well as the usual studios, Emporium Suites has a good selection of one and two-bedroom apartments, making it a great choice for families. The building itself has excellent facilities, with a rooftop swimming pool overlooking Benjasiri Park, several restaurants and an excellent gym. Emporium Suites also has one of the best locations in the city, with a direct connection to The Emporium and a footbridge connection to BTS Phrom Phong. If you want a luxurious serviced apartment with an unbeatable location, you’ll definitely feel satisfied here. Marriott Executive Apartments Sukhumvit Park is a highly luxurious serviced apartment building on Sukhumvit Soi 24, a short distance from BTS Phrom Phong. Although the building is a five to 10 minute walk from the nearest Skytrain station, a free tuk-tuk shuttle is available for guests. The apartments here are some of the most luxurious in Bangkok, starting from about 45 square metres and working up to large two-bedroom suites. 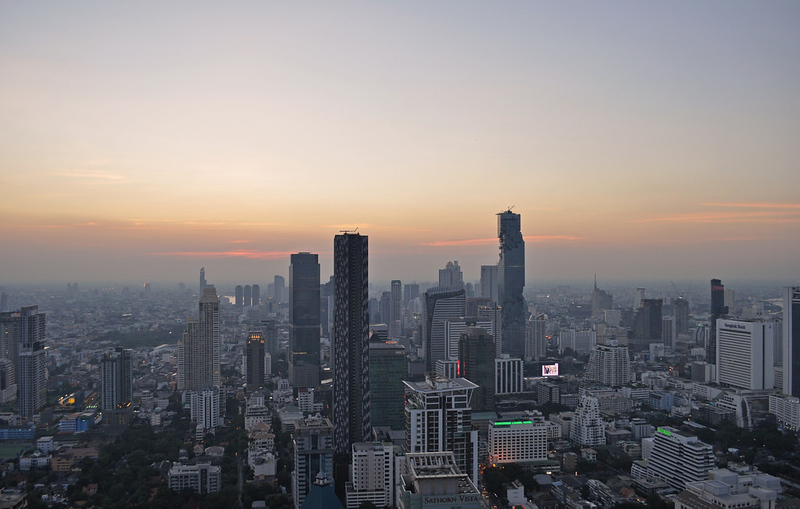 Most rooms offer great views of the entire Sukhumvit Road area and its densely developed skyline. Facilities at the Marriott Sukhumvit Park are excellent, with an outdoor pool, gym and several restaurants. Rooms are fitted with modern furniture and have small, well equipped kitchenettes for cooking at home. Free, high-speed Wi-Fi is available throughout the building. Extra facilities include a 24-hour spa and tennis and badminton courts, as well as a golf swing simulator. As serviced apartments go, it’s very tough to beat the Marriott Executive Apartments Sukhumvit Park without spending two to three times more. The Somerset Sukhumvit Thonglor has a selection of luxurious serviced apartments located on one of Bangkok’s most popular entertainment streets. Rooms here are fairly spacious, starting from 40 square metres, and offer great views of the nearby skyline. All units at the Somerset are fitted with kitchenettes with basic cooking equipment, work desks, a dining area and spacious bathroom with a full-size bathtub. The furniture is modern and high quality, with everything you’d expect from a four-star hotel complex. The facilities at the Somerset Sukhumvit Thonglor aren’t quite five-star level, but they’re pretty close. There’s a large outdoor pool that offers good views of the surrounding area, as well as a fitness centre, bar, restaurant and resident’s lounge. The building operates a free shuttle bus to and from Thonglor BTS station, making it easy to get around Bangkok. The apartment complex itself is a short walk from several supermarkets and a great variety of Thai and international bars and restaurants suitable for all budgets. Thanks to its convenient location, great facilities and spacious apartments, Somerset Sukhumvit Thonglor is a great choice for couples and families that want the luxuries of a four-star hotel with the comforts of a real apartment.